Six Nations Title chances - Who needs what to win? A quick rundown of who needs what in order to take the title. 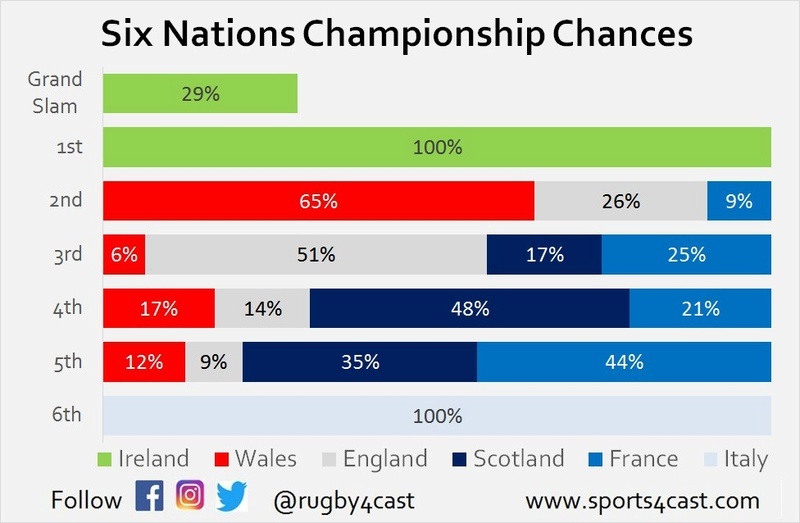 Ireland, England and Scotland are the only ones with realistic chances. Mathematically Wales could do it, but the chance is around 0.3%. Ireland are 5 points ahead with 2 games to play. If they beat Scotland (H) and England (A) they will win the title and take the Grand Slam. We give this a 22% chance. However, it is more likely that Ireland will lose in Twickenham (we give Ireland around 30% chance of victory). Under these circumstances, bonus points (BP) will be important. - then England will need to BP France and Ireland AND overcome the points difference, which we think is likely to be around 32 points. For example England would need to beat Ireland 43-10. - then a BP win for England over Ireland would see England take the title. - a normal win and overcoming the points difference would see England take the title. Realistically, this would amount to a BP win. 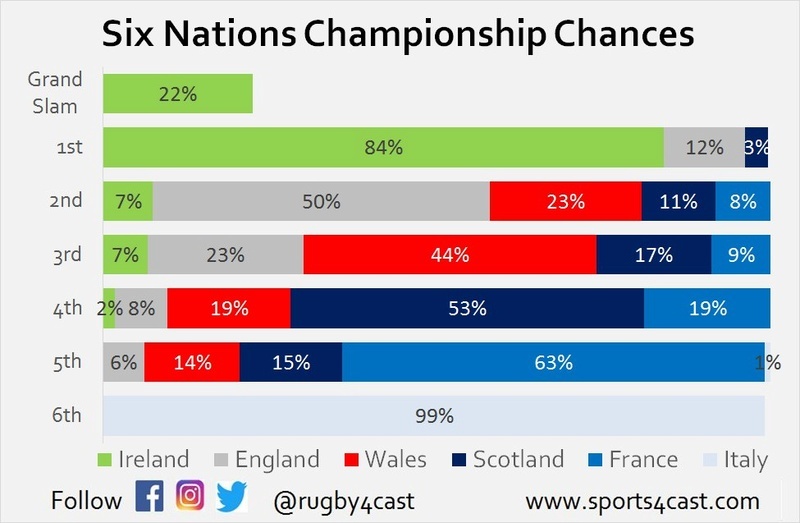 - If Ireland lose to Scotland, and England beat France then the title chances swing back in England's favour, roughly 70:30. We give this a 3% chance of happening. - England to beat Ireland. Let us know if you want any other scenarios run! And if you like, follow us on Twitter etc (@Rugby4Cast) to get similar infographics and a live feed from our brains. 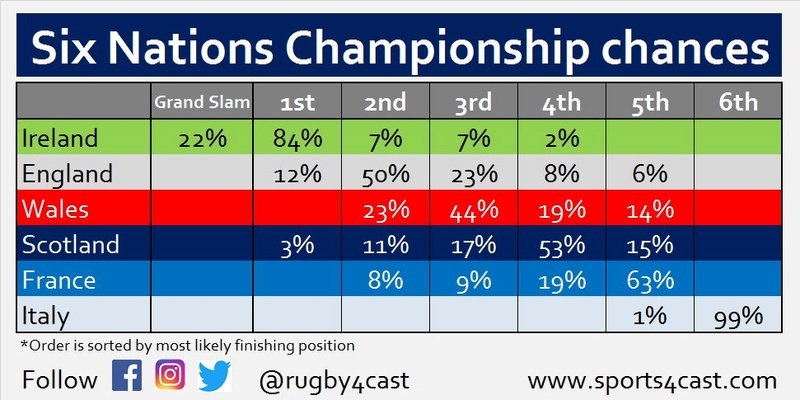 Re: Six Nations Title chances - Who needs what to win? Scotland could quite probably best Ireland, who've been poor this tournament but extremely lucky with ref decisions and their opposition being worse. England could easily best France. Or the French could finally pull s good game out and hammer us. The computer doesn't give Scotland much chance in Ireland (~20%) due to their away record being so poor, and Ireland's home record being so good. 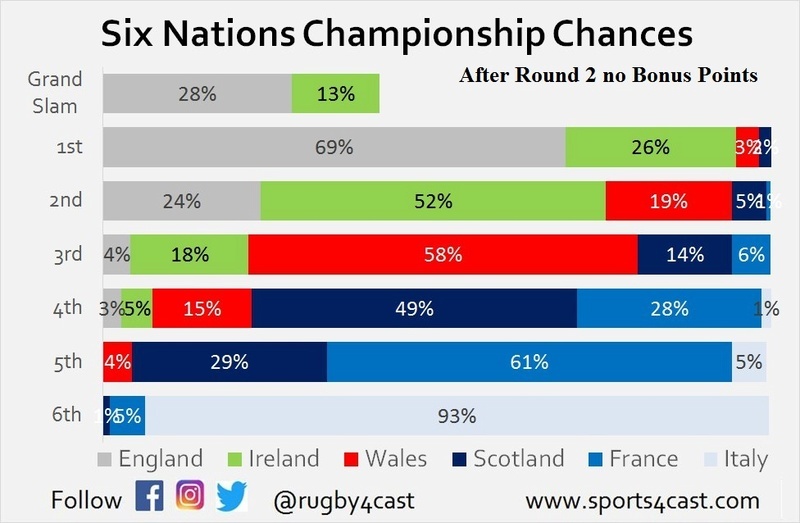 It would be close, with both England and Ireland being in with a shout on the final day, but realistically, the points difference would be too great for England to overcome. Not the only scenario for Scotland. For Scotland to win the title they could get BP win against Ireland (quite possible) and Italy (very likely). That would put them on 18. 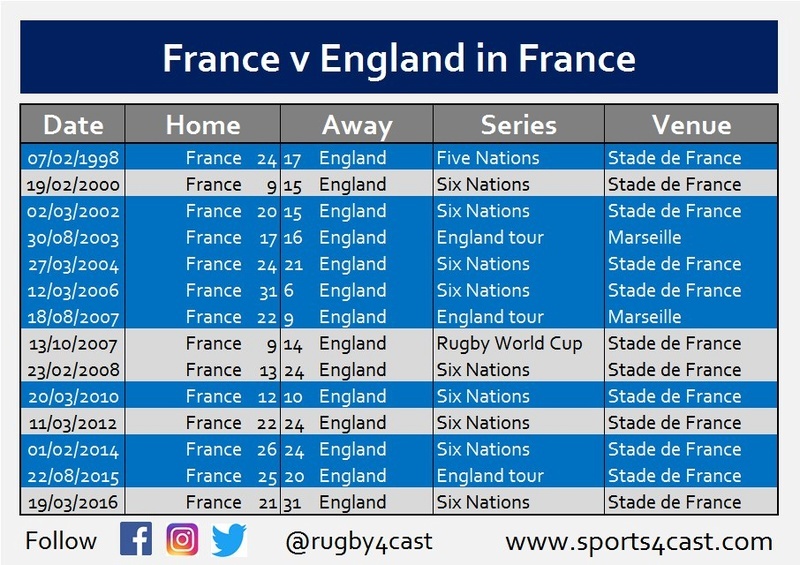 England could beat France with only three tries and then be on 13 points. And then beat Ireland again with no BP putting them on 17. Or England only beat France and Ireland by small margins and no BPs. Scotland don’t get BP win against Ireland but get a cricket score against Italy and win on PD. So let me get this straight, Wales are set to play the two worst teams in the tournament at home where it's more likely than unlikely that we get a bonus point against both, yet Scotland have a greater chance. Is there something I'm missing? The reason we didn't go into detail for those scenarios is that they are very unlikely. Scotland getting a BP win in Ireland would be difficult - their away record is poor and Ireland's home record excellent - and the computer gives them at just a 1% chance of achieving that. However, if they did get both BP's and England only got 4 points from each game, then they would indeed give them the title. The other scenario you mention (cricket score on Italy) is also possible, but the points difference required would be large, and therefore also unlikely. Yes, quite possibly. Wales have already lost twice, and Scotland only once. Scotland winning their last two games, even though against stronger opposition, means they are more likely to finish top of the table. 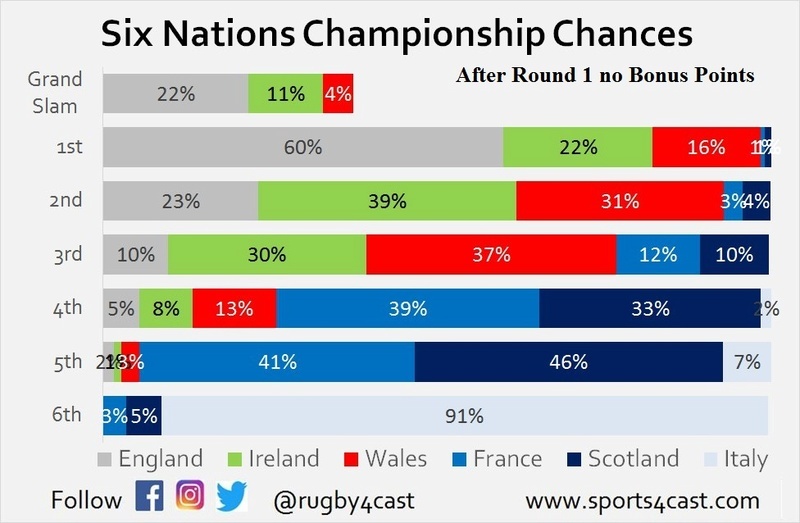 However, as you can see from the graphics, Wales are more likely to finish above Scotland, due to the fact that they still have the easier teams to play. Does this make sense? 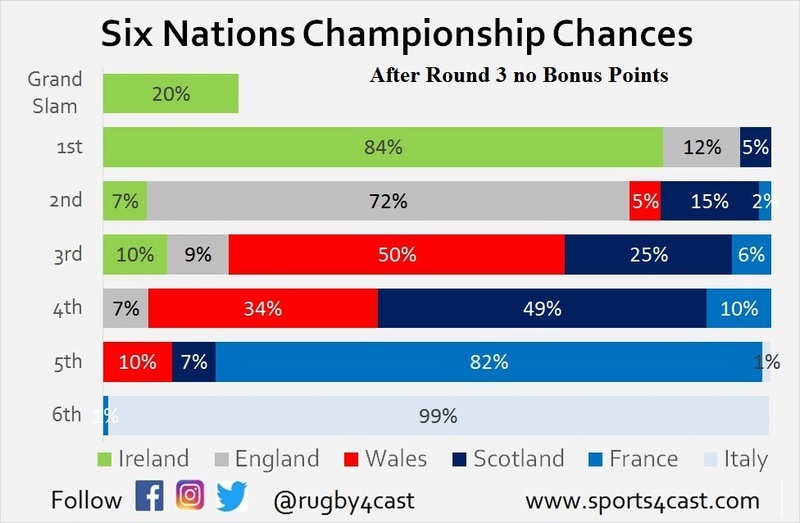 Would there be much difference in these chances if we didn't have the bonus point system being used ? Who needs what to win? Well I don't know about any other sides in the contest - but we need the ball! Lots of it. Great stuff, will give you a follow presently. yappysnap wrote: Would there be much difference in these chances if we didn't have the bonus point system being used ? Almost certainly, Ireland have the best wins record and the best bonus point record. To be caught, they now have to slip up and lose a game and also slip up on bonus points. England paying for failing to put their foot down against Wales after 20 minutes and failing to secure the bonus point against Scotland. Scotland are also paying for an absolute hammering by Wales and failing to score a second half try against England. 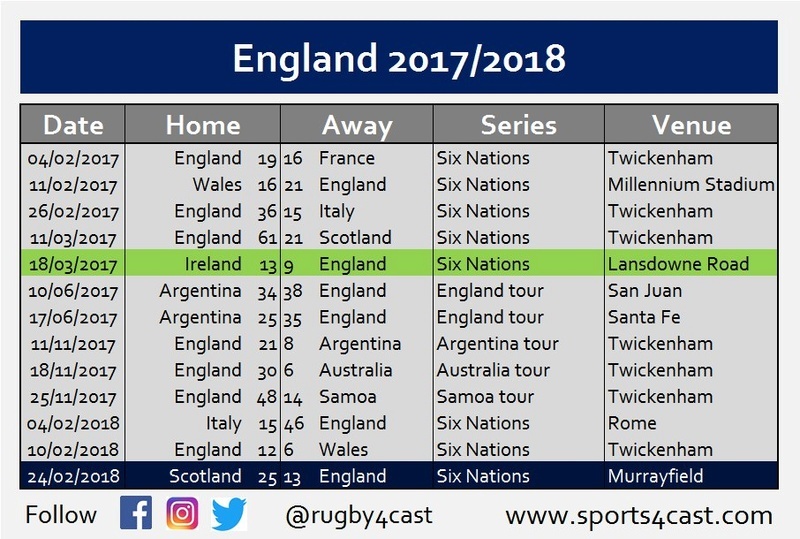 Looking at the "most likely" outcomes, England have to be targeting a try bonus point and about a 15 point win in Paris. It would be an absolute stretch, but it's doable if we can coax France into playing an open game, and then execute almost flawlessly across the 80 minutes. Couple that with the other results going exactly with the stats, and it would be our tournament. Yes, Ireland could TBP against the Scots or turn us over on the last weekend and throw a spanner in that plan, but we can only plan for our next game and we have to be targeting something special in Paris. I'm sure it's rare in a Six Nations game for the opposition team to score 4 tries in Paris, but New Zealand managed 5 in the Autumn. If Eddie Jones is serious about making us the number 1 team in the world that's the level we have to achieve, and this is his chance to lay a real marker and get us back in the Championship hunt. France are horrific. If we don't beat them comfortably then don't deserve anything. Scottrf wrote: France are horrific. If we don't beat them comfortably then don't deserve anything. They haven't offered much, but Ireland only beat them 13-15 with no tries. They beat Italy as well. Going back a few years, they won both their home games last year (against Scotland and Wales). 2016 they beat Ireland and Italy, but we beat them by 10 points and scoring 3 tries (this was before the introduction of bonus points). 2015 they beat Scotland, but Wales beat them by 7 points and scoring 1 try. 2014 they beat us and Italy, but Ireland beat them by 2 points and scoring 3 tries. My point is that we have to win (first), secure a bonus point (second) and try to close a points difference gap (third), and no away team in the last 5 years has scored 4 tries in Paris or won by more than 10. We will need to do both - beating them in a tight game will not be enough. However, my point about the All Blacks is that they can be beaten heavily at home, we just have to rip up the standard Six Nations playbook to do it. We need to be bold, we need to be prepared to attack when it's on and we need to be ready to turn down shots at goal if we sense something more might be there. This French team is worse than any of those years. Ireland should have done better, but since then they have had lowered confidence and a disrupted camp. Italy should have won. It was one of the worst performances I've ever seen from a tier 1 side. The fact they didn't just shows Italy shouldn't be in the 6N. Agreed. France aren't great at the moment, but they seem to be difficult to put away soundly. Stats wise, they have lost a lot, but not by much. Ireland and Scotland only just snuck past them. Currently we have it as about 17 - 23 in favour of England, with England having around a 64% chance of victory. Scottrf wrote: This French team is worse than any of those years. Ireland should have done better, but since then they have had lowered confidence and a disrupted camp. Let's not repeat the Scotland mistakes and under-rate a home team. Or maybe, because it's all maths now, I should be encouraging such an opinion. I don't. I predicted Ireland to win last year because of that, Wales to beat Scotland. But Scotland haven't lost 9 in 10. England are undoubtedly a better team than France, and should win. It is entirely possible that our algorithm isn't estimating the chances correctly. 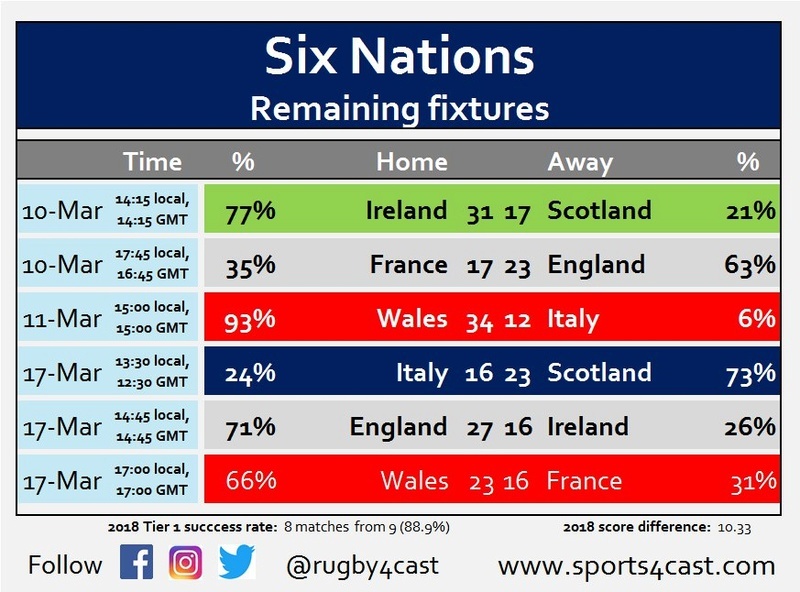 It seems to be doing alright however, currently our average points difference in the Six Nations is around 10 per match, with the only match we got wrong being Scotland England. It gave Scotland a 33% chance pre match, which was probably higher than most people did. 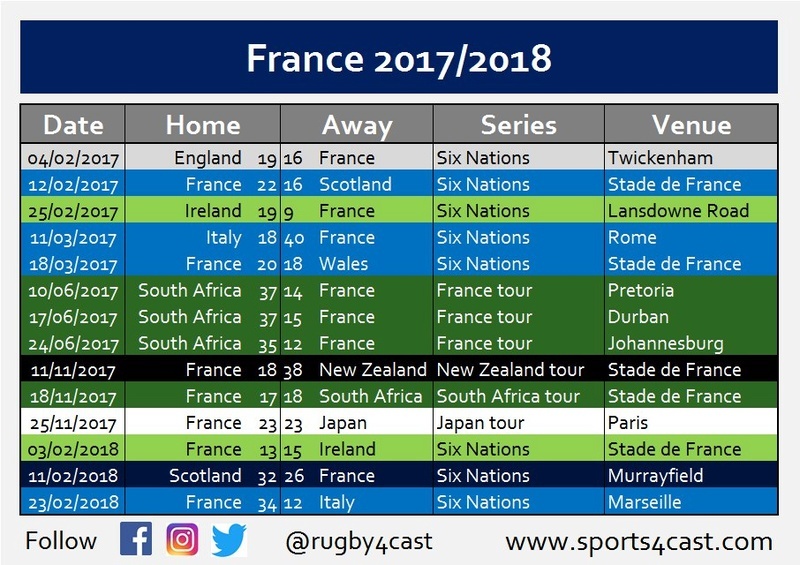 If we look at the 2017/2018 for both teams, England's record is clearly better, but France have probably played harder games so their record will look worse if you just look at straight wins and losses. Well, France has to get some form sometime....they are, after all, the most consistently competitive European team in WC history. So they'll be aiming for that campaign, whether you or I believe it or not. The players always get more lead into their pencil when the WC is around the bend. 64% does seem a little low, but England's 6 Nations record in Paris is LWLW, so 50%. Yes, England do have form on their side so we can increase it. But if England played France every week for the next 10 weeks, how many wins would you give us? 7? 8? I think around 7 is right, so 64% isn't miles off. I think it would be a special performance to get a try bonus point win in France and a positive points difference of 15+ or more. It rarely, rarely happens. In the above scenario of playing them every 10 weeks, I'd say we might get that twice. But that's the difference between where England are and where Eddie has consistently said he wants to be. We have it in us, but it's by no means certain or even probable. We will have to play better than we have all tournament so far. If we achieved the above, it would be our best away performance since Australia 2016, regardless of France's current form. For reference, France v England over the past 20 years. To explain slightly further, our model works by looking at historical scoring patterns in matches (both generally and specifically in head to heads), the current rankings and location to work out an expected score for both sides. More accurately speaking, this means each predicted score is actually a metric to describe the relative historical strength of the two teams, based on their performances over previous few years. However, we think it is more fun to think of them as predictions. At the very least, it certainly serves to provoke the trolls lurking on Twitter! 9? This isn't France of 4 years ago. France were a last minute drop goal away from beating Ireland (who on form are being touted as currently superior to England) and a try away from beating Scotland, in Scotland. Beating England at home doesn't seem to be unreasonable. Wales BP win over France (in Cardiff - if other results have gone our way) is a possibility. Scotland to beat Ireland in Dublin - After the Calcutta match, I wouldn't bet against it. France and England to Draw, in Paris. Happened before, its not impossible. Scotland to beat Italy would expect it. England to beat Ireland in Twickenham, again realistic chance. 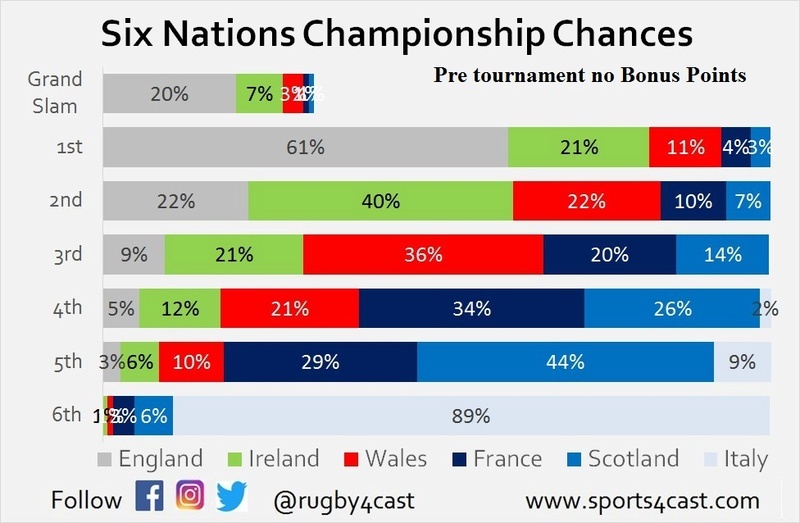 So I would say the chance of Wales taking the title is possible..... if not probable (would say a little more than 0.3%, but not by much)..
Actually this scenario is the reason I believe BPs should be scrapped. If this happened, it would mean Wales would only win 3 games, Scotland would win 4, but Wales would top the title on BPs. That's just not right.. The team winning the MOST games should be the first decider for the title. But...but...... sure that would be a 'devalued' Championship!!! I think it's also doable for Wales if France beat England, which is more likely than the draw. If France beat England and Wales beat France, France will be on 2 wins and not a threat at the top end of the table. England would be on 3 (as Wales would be), but Wales would have more bonus points under this scenario. rugby4cast wrote: France were a last minute drop goal away from beating Ireland (who on form are being touted as currently superior to England) and a try away from beating Scotland, in Scotland. Are you using ELO? And if so, how far back do you start? And do these ELO scores include non-6nations matches? No, we tried an ELO rating system and it didn't seem to be as accurate. Basically, we look at scoring patterns in matches over the past 4 years, head to heads over the past 10 years, their current official World Rugby ranking and location, and then slam them all together in some ungodly (but extremely precise ) algorithm. OK, everyone ready for this? I've got something for the differences in what the title chances would like at each stage under bonus points and non-bonus point championships. Broadly speaking however, the differences between the two circumstances can be seen. Under bonus points the tournament is more open, with more teams able to reach higher or lower positions due to more scoring options, which makes sense. Under the old system, you can see as results come in positions become more 'fixed' and possibilities are removed. 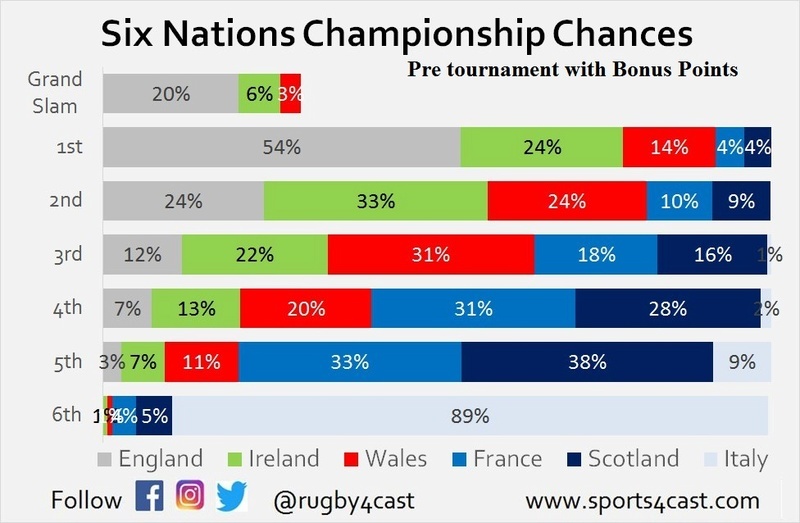 Before anyone asks, I'm not sure why Ireland have exactly the same 84% chance of winning the tournament after Round 3 under both circumstances. At the moment it just looks like a coincidence, due to the fact that under the no bonus point situation Ireland's points difference is better, and would be hard to overcome. Yeah, I can see that. I played around with my own ELO model last year and the lack of international matches per year vs other sports where ELO works well was a real issue so gave up on it. I suspect PRO12 would work better with ELO. I am no expert, but run sales at a machine learning startup, so out of interest what type of model are you using? Have bookmarked your site, though if ye ever get around to a 30 min weekly podcast, I would love to hear that aswell! Indicates that without BPs, the comp seems even less competitive going into the next roound. I guess you've been looking at Italy's scoring over the last few years, and their number of wins too. If all stays the same (I know it won't) can you predict how long it would take for them to win three or more games? Or even win the tournament? I'd guess until about 2024-25 for three wins. In terms of winning the tournament, according to the first graph of the most recent post they have a less than 0.5% chance of winning this year's tournament (because they don't have an attached % next to winners). If we assume this is 0.5% for ease. If you played the tournament 10 times there would be a 95% chance Italy would never win it. If you played the tournament 100 times there would be a 61% chance Italy would never win it. If you played the tournament 982 times, there would be a 0.73% chance Italy would never win it. So we can say with 99.27% confidence that they should get a win sometime before the year 3000. I think this is actually fairly easy ... the computer gave Italy just 0.05% chance of winning the tournament, which would suggest that 1 in 2000 times we get an Italian Six Nations champions i.e. 2,000 years. We gave them a 0.7% chance of winning 3 games, so roughly 149 years for 3 wins. This does seems outrageously long, personally I don't think it will be that long(! ), so I'd be interested to hear your take on it. 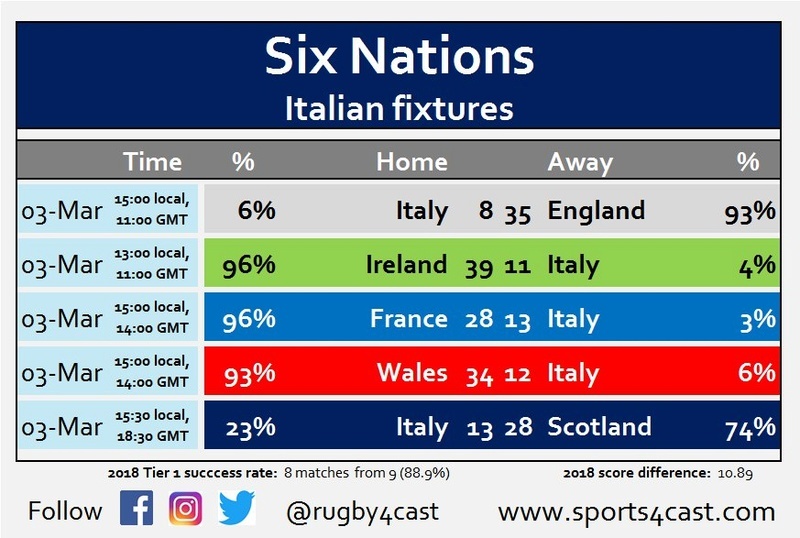 Admittedly, I didn't run it on the reverse fixtures for next year (i.e reversing the home and aways) - it was simulating this years set of fixtures 5,000x - and Italy playing 3 away games (as they have this year) are probably less likely to win 3 games (ASIDE: we think that some teams have 'easy' years and 'hard' years depending on the home/away advantage and who you have where - currently looking into this) so 2018 may be a particularly 'hard' year for Italy. Happy to argue the maths of it, I may have got something wrong! For reference, an estimate of 2024/2025 for 3 match wins is roughly 1 in 7 years (assuming we start from now?) which gives an implied probability of 14.3%. Robbo's beaten me to it. If you plug in the actual percentages that we gave them above do you get the same answer? No problem, it was an interesting exercise. Please feel free to get in contact if you have any more questions or ponderings. Personally,love looking at all this kind of stuff, and it often leads to a good article which we can post on the website as well. So thanks! Hi rugby4cast, I never comment, just read with interest. Nobody has mentioned France's chance, (maybe nobody cares). Obviously very unlikely but still as much a possibility as Wales winning as no draws are required. Of course that's just a thought. Ninjarugby wrote: Hi rugby4cast, I never comment, just read with interest. Hello Ninjarugby! Sorry, thought I'd replied but it must not have sent. Yes, indeed France could indeed win it through that route, it's just that was even more unlikely! We certainly don't not care about France, it's just quite difficult to go through every single possibility, and I just tried to go through the most likely ones proposed by the model. If the points difference between Ireland and England is 32 then England would only need to beat them by 17 to overtake them. The difference would count both for us and against them (so amount to a 34 point swing in total). Unless you actually mean the points difference would be 63-64 and you'd already factored the double counting in? Nope. Absolutely right. Thanks, good spot. Trying to say that we care about the French too! Updated for the weekends results. Ireland obviously have the whole thing wrapped up, but it could be tight in the middle now. Wales have the advantage due to their bonus point win over Italy, but almost any of England, Wales, France and Scotland could occupy 2nd - 5th. There is still a lot to play for this weekend! Also, there was a discussion with someone above about the chances of France beating England ... we did say France would be good at home!